If you support multiple brands, you can associate a brand with the Facebook Page or Pages you are monitoring. Tickets created through Facebook will have the brand that you associated with your Facebook Page. If you change brand for a Facebook Page, any new tickets will have the updated brand, but any existing tickets not be updated. You can add one Facebook Page (per account, not per brand) on Essential, while on Team, Professional, and Enterprise you can add up to 15 Pages (per account, not per brand). If you haven't already done so, click Add new page to add the Facebook page you want to monitor. For more information, see Setting up your Facebook channel. Beside the Facebook page, click Edit. 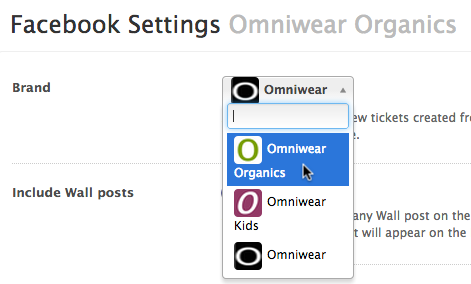 Select a Brand from the drop-down menu, then click Update page settings. Can my customers give a satisfaction rating via Facebook and Twitter?